Greetings gardeners and stewards of the land. In case you didn't already know Ecoworkshops is presenting a seminar on World Herbs at the L.A. Arboretum on Nov. 3. 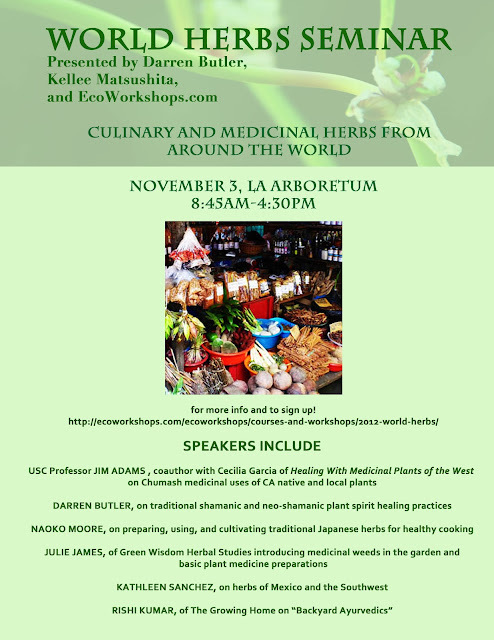 I'll be speaking about Mexican and Southwestern herbs. Some varieties that we will go over include, salvia hispanica, amaranth, and mayo/yoeme basil. We'll discuss why certain varieties have been lost over time, how to re-introduce them into our local environments, and the best ways to prepare and store harvests. Health properties as well as medicinal uses will be a secondary focus. Not only will you walk away with a plethora of priceless knowledge, you will also leave with resources that you can take home an apply.